Kung-Fu is a term used to represent all Chinese martial art styles. It actually means to be a disciplined person or a person who works hard at developing a particular skill. The philosophy with Chinese martial arts is not just to be able to defend oneself but to prolong ones life. This philosophy and history has lead to a difference in the practice and the attitude of students of Chinese martial arts. Ones mental attitude and development are just as important as the physical development. The philosophy in training promotes this idea of harmony with ones self and nature. Kung-Fu is also a comprehensive martial arts system. Martial arts techniques are divided into four categories: Striking, Kicking, Seizing and locking joints, and grappling and throwing. This allows a practitioner to deal with many different types of attacks and be able to deal with them effectively. Traditional Chinese systems incorporate Health and fitness, character training and self-defense. What is self-defense? Self-Defense is the use of mental, verbal, and physical tools to protect your life. It has been taught for thousands of years through martial arts. Self-Defense incorporates techniques, which can be learned and applied quickly. You do not need to know martial arts or how to fight to defend yourself. Yet the more you learn and practice the more you have in your arsenal to defend yourself with. By learning to defend yourself you become more confident and safer in your every day life. All you have to do is listen to the news to find about all the crazy things going on in our world today, but it doesn’t mean you have to live fearful. You need to be aware, protected and safe. That is what self-Defense is all about. "My name is Luis and I developed this site to promote and spread my love for martial arts, specifically the traditional arts. I want to be able to share my passion and knowledge of martial arts. 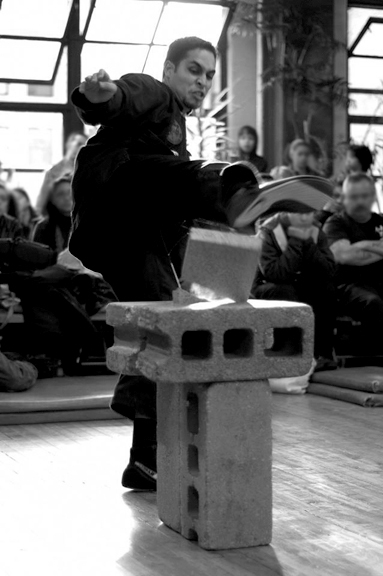 I am a 3rd Degree Kung-Fu Wu-Su Instructor in NYC with over 18 years experience in Traditional Kung-Fu Wu-Su." The values of a positive attitude, discipline, and respect gained from the training are priceless. They are values, which can be taken and applied to all aspects of your life. Making you a well rounded individual. Kung-Fu itself means to be a disciplined person. It is not restricted to martial arts but applies to all aspects of life. It means you are a person who has developed a certain level of skill in a particular area through hard work. Group classes and private lessons are offered in Northern Shaolin Kung-Fu, Self Defense and basic Chi-Kung.